My wife has neuromuscular kyphoscoliosis brought on by Parkinson's. After seeing numerous doctors, we went to Columbia Presbyterian Hospital and they said nothing could be done. Her condition worsened and started to affect her ability to keep food down. Dr. Reich explained to us that this was a very serious 2-part operation. The care, attention and devotion this man showed my wife can not be put into words. Today, she is walking straight and has returned to work. Thank you for taking me as your patient. Your dedication to your profession touched me and my family. Your care, support and concern for my well being as a person is very much appreciated and will always be remembered. Again, thank you for making it happen. You have made a difference in my life. My family and I wish you a great practice and the best of everything. P.S. You have a great staff as well. Dr. Reich is the best doctor that I have ever been too. He takes the time to explain everything to you. This is the first time in 17 years that I did not have back pain. 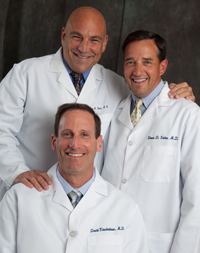 If you need a spine specialist and do not choose Dr. Reich, you are making a mistake.